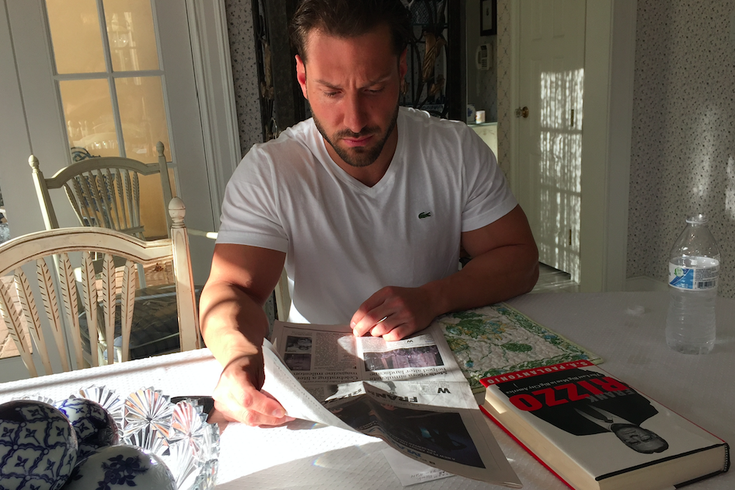 Joe Mastronardo, grandson of late Philadelphia Mayor Frank Rizzo, has concerns about how Rizzo's legacy will be perceived in modern times. The email – sent a few days after our post regarding Theatre Exile’s new play about late Philadelphia Mayor Frank Rizzo ran – instantly drew attention. It was sent by Joe Mastronardo on behalf of his father Joseph Vito and his mother Joanna, daughter of the larger-than-life figure on whose life the play is based. The play formally premiered at Christ Church Neighborhood House in Old City on Wednesday night. On Thursday morning, the e-mailer and his mother welcomed PhillyVoice into their palatial Jenkintown mansion. Mastronardo’s father couldn’t be there. He’s currently serving time in federal prison on charges connected to a "gambling empire." His guilty plea led investigators to drop charges against his wife but not his son, who is currently under house arrest. Having faced a lifetime of what the family deemed anti-Rizzo coverage, Joanna mentioned that her concerns were soothed on this day, having talked to her brother, Frannie, who’d just seen it on opening night. "Now that I know it's decent, I'll be fine with it," said Joanna, who noted that she liked the book by Sal Paolantonio on which the play is based. To Joanna, Frannie saying it wasn’t as worrisome as the email indicated was a great relief, even if she learned that there's a line in the play about Rizzo "getting soft on crime because his daughter married a bookie." The former Philadelphia city councilman offered a more in-depth review during a Thursday afternoon phone interview. “I thought it was really good, but I guess I can’t really be objective when I know the real stories,” said Frannie Rizzo, who noted that African Americans who worked on his dad's security team were also in attendance. “To a person who wasn’t his son, daughter, wife, loved one, it would appear to be realistic. “I think there was too much about the racial aspects. I know my father was a controversial guy, but I don’t think he was that kind of person. Even when I was watching him and he didn't know I was watching, he wasn't that kind of person." That racial aspect really ticks Joe Mastronardo off. On Thursday, he spoke about the lingering perceptions of Rizzo in an era where people are afraid to speak their minds or distance themselves from a crowd that often feels "factory-made." "I know this is going to be the most divisive thing I've ever written. People who loved Rizzo will say I made him a monster. People who hated him will say I was too soft on him. I'm screwed either way." Responded Mastronardo, "I know this guy wasn't a racist," but that the "liberal agenda is to make everything about race." "It just seems convenient that the timing, when everything is going down with the racial topics and everything. There are so many things you can write about besides that," he said. "If this is a smear job, I'm not going to take this. I'm just not. I've been through too much with my family, too many things that I don't agree with, I'm not just gonna sit around and be quiet. "People who do these things have just gotten used to my family keeping their mouths shut, 'write whatever you want and it's cool.' I'm at the point where I can't do that anymore. Now, if this play is good, if it's fair, that's fine, that's great, I'll say so. But if there's anything I disagree with, if there's anything I know not to be true, I'll let that be known." Mastronardo recalls driving around the city with his grandfather as times that gave him an insight which outsiders can't draw upon when discussing who Rizzo really was. Rizzo would be an outlier "in this politically correct era we're in now," he said. "That stuff didn't matter to him. Tell the truth and you don't have to watch what you say. I have a huge problem with that whole 'watch what you say thing,'" Mastronardo said. "Everybody wants to live in fear now. That's the complete opposite of how I was brought up," he continued. "That's why there are so few great people, but a bunch of mediocre people. Society teaches you to fall in line. Nobody has balls to stand out. My father has balls. My grandfather had balls. You never see anything like those two guys ever." All in all, though, Frannie Rizzo son thinks the performance's existence is a net benefit from a legacy perspective. Mastronardo said, "It'll make me feel much better," if his mother returns home with a positive review, but he will withhold final judgment until he sees it for himself. That could be problematic, though. His house-arrest restrictions bar him from heading to Old City to see the play, but he's hoping that someone can provide a DVD or other version of the performance so he can watch it from afar.